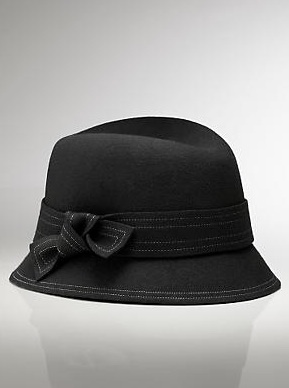 Kate Spade's Galleria Marlena wool cloche retails for $125. This hat from Forever 21 is similar, but still more of an inspired by option - but retails for an extremely affordable $13.80. Add a little retro glamour to your wardrobe for a fraction of the price! Click here or on the photo below if you're interested in purchasing. Talbots also has a version for a bit more $ (but still less than the Kate Spade version). It retails for $49.50 and also comes in a light tan color. Click here if you're interested in purchasing. yuh!!! it's so cute...i love it!! !